Is there something you'd like us to buy for the browsing collection? There are three ways to make a request: submit through the form linked below, email acquisitions@davidson.edu, and students may select books in person at Main Street Books (126 Main St., Davidson NC). Students can recommend books at the store--just bring one or two items to the counter, let the staff know that you are a Davidson student, and give them your name. 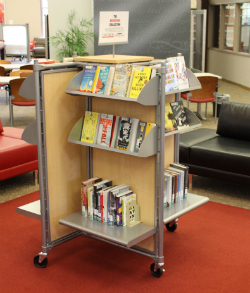 Library staff will purchase new items every Monday, and the book will be checked out to the student who requested it. You'll be notified via email when your book is ready! Want to scroll through this collection? Type * and click to search. Browsing Collection items are lent for 21-day periods. Bellwether Award winner Susan Nussbaum's powerful novel invites us into the lives of a group of typical teenagers--alienated, funny, yearning for autonomy--except that they live in an institution for juveniles with disabilities. Davidson College's 2017 Common Reading Book. A magnificent tour de force chronicling a young slave's adventures as she makes a desperate bid for freedom in the antebellum South. Author Colson Whitehead will be speaking on campus this year.